I've been reading Reynolds books since he began writing them and have seen him grow over the years from a seriously talented writer to one of the best in his field. 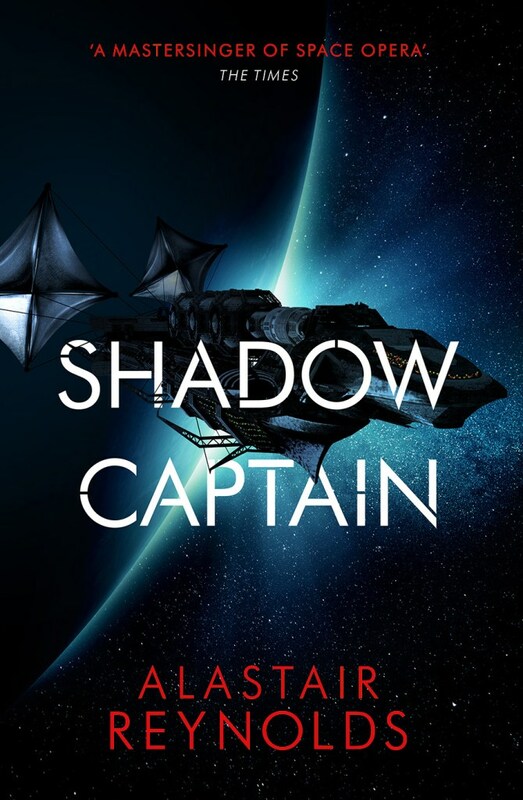 Revenger was one of his finest works to date, Shadow Captain eclipses it easily. It's the second in a planned trilogy but manages to avoid any "second book" syndrome. Revenger follows the sisters Adrana and (Arafura) Fura Ness as they sign onto the good ship Monetta’s Mourn under the captain Rackamore, in an effort to avoid family bankruptcy. Set millions of years in the future, travelling through space isn't without risk and Rackamore made an enemy of one of the most dangerous pirates in the solar system - Bosa Sennen. The piratical nature of the story which includes a futuristic style slang, brings a real warmth and sense of place. This is combined with a dynamic and rewarding story set against a far future solar system that has been entirely re-shaped. Large planets as we know them no longer exist, instead humanity (and alien) survive on smaller rocks as they orbit the now old sun. Technology and other treasures from previous civilisations are salvaged from the more elusive "baubles". Aliens (crawleys) live amongst humankind (monkeys) and ships use solar sails as a method of propulsion. Along with trading salvage, the system uses a currency known as "quoins", a currency that has an air of mystery about it. Shadow Captain see's the sister's re-united but much changed from when they were last together. They do however now command their own ship and crew. The ship they sail used to belong to Bosa Sennen, marking them as a target for any adventurous captain. Lurking in the background is the promise of Sennens rumoured cache of vast wealth, something that is fast becoming a single-minded obsession for Fura. Revenger was largely written from the point of view of Fura, in Shadow Captain the focus and POV is switched to Adrana. This provides a thoughtful, reflective counterpoint to the previous book. Both sisters hold a deep distrust of each other and their experiences have coloured their differences. Adrana suffers from the conditioning that Bosa Sennen carried out (she was grooming Adrana to be her successor), while Fura's difficult journey - not just from what she experienced but the choice's she has had to make - resulted in physical and psychological trauma. The loss of an arm and becoming "glowy" just a reminder of her problems. They are the yin and yang of the story. The theme of escape is one that continues through Shadow Captain, previously it was the sisters escaping their family and boredom. Now though they are trying to escape their recent past and the legacy of Bosa, along with the fall-out of defeating Bosa and taking the ship. It's an interesting idea that works well, examining what happens after that climatic ending that so many stories finish with. I love the futuristic, cyberpunk-piratical style and the world-building is tremendous, evoking a real sense of wonder in this solar system much removed from our own. The author even manages to introduce us to a far-future version of the zombie (twinkle-head). He has also created a real sense of mystery about much of this universe, from the cyclic nature of past civilisations (along with the chaos in-between) to the long dead alien race and their still-somehow-sort-of-alive skulls which can be used to form a telepathic link. I also love the way the author doesn't send the characters on an easy ride, things don't go as planned and even when you think they've finally managed to achieve success he throws in a completely unexpected curve-ball that sets things up for the next book. Shadow Captain is a delight. It's rewarding, entertaining fiction that manages combine the big ideas of hard science fiction and space opera with a more personal, character driven story. Unmissable science fiction. Written on 16th January 2019 by Ant.